The new Lord-Lieutenant’s Cadets for Derbyshire had a surprise encounter with a member of the Royal Family when they were presented with their official badges in Staveley near Chesterfield during a recent Royal Visit to Derbyshire. 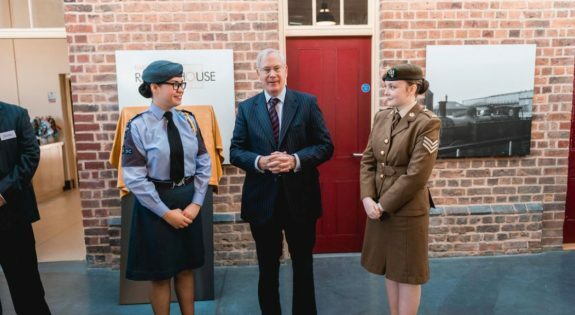 The Cadets from both the Army Cadet Force and the Air Training Corps were at Barrow Hill Roundhouse and Railway Centre to support the Lord-Lieutenant it was their first event since their appointment. 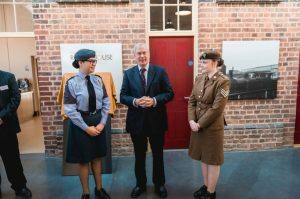 Both were taken by surprise when the Lord-Lieutenant asked HRH The Duke of Gloucester to present them with their badges in his place. Cadet Sergeant Jade Duce, aged 16 from Eckington Detachment in Derbyshire Army Cadet Force was one of the lucky cadets to be appointed by the Lord-Lieutenant. She explained: “When I was informed that The Duke of Gloucester was going to present me with my badge, I was honoured. I don’t believe that there are any former or serving Lord Lieutenant’s cadets that have been given the honour of a member of the Royal Family presenting them with their appointment. Being a Lord-Lieutenant’s Cadet is one of the highest honours for any member of the Cadet Forces, they will spend the next year assisting the Lord-Lieutenant at civic engagements across the county. “I was elated and overwhelmed when I was told I was going to be appointed the Lord-Lieutenant’s Cadet for Derbyshire Army Cadet Force as I never expected to be given such an opportunity."